This part covers what I have learned about reviewing the flash cards. The premise of Anki (and related types of software) is spaced repetitions. To get the most out of the software, you need to make yourself get in the habit of reviewing your cards every single day. 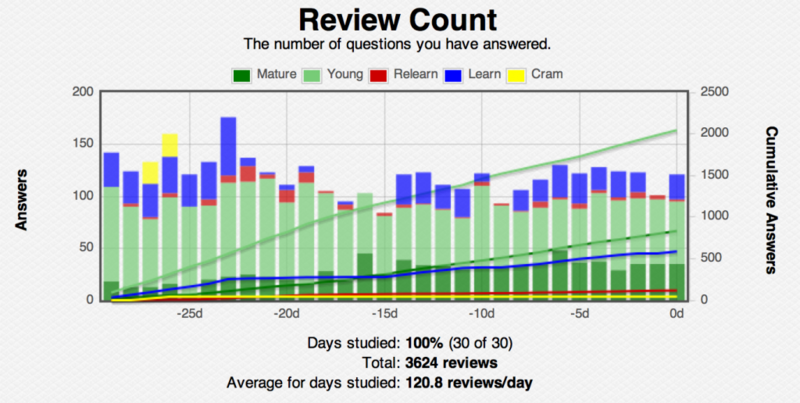 When you stop reviewing, you very quickly start to lose retention. However, by maintaining the habit of reviewing cards every day, you will spend less time each day reviewing because the retained cards will be spaced further apart. When you’re very deep into studying a particular topic, you may create a decent amount of cards in a short period of time, especially if the topic is new to you. This will temporarily increase your time spent each day reviewing cards. The default Anki setting is to introduce 20 new cards for review each day, in addition to the cards that were already scheduled to be reviewed on that day. There is a tradeoff to be realized here. If you have a lot of new cards, your daily review times will be increased. If you introduce fewer new cards each day, it will take longer to learn the material. I have tried it both ways, and found the default setting to be just about right. If after your daily review session you feel like you could take in some more cards, you can easily add new cards to the day’s review session. I recommend doing this 10 cards at a time. Just remember that in doing so, you will have more cards to review over the next few days. When you are creating lots of cards in a short period of time, I highly recommend setting the review order to chronological, instead of random. By changing this setting, new cards are introduced in the order of creation. When you create multiple new cards, chances are very good that the cards will be related to each other in some way. During the initial review of these cards, you are more likely to have better retention by seeing related cards close together. As time passes and the reviews become more randomized, the initial bond of related cards will have a greater impact on retention. After you have added (and reviewed) the bulk of your cards, it may be beneficial to return the setting to random as you add fewer miscellaneous cards over time. When reviewing your cards, resist the temptation to click the “easy” button, except for perhaps the first viewing of the card, which defaults to showing the card again in four days. I discovered that for a large number of cards, if I had clicked the “easy” button three or four times, by the time card was scheduled to be shown again, the spaced repetition was too great, and I had trouble remembering it. When I stopped doing this, and reverted back to being honest with myself (and clicking “again” when I really couldn’t fully remember the answer to a card), I found my retention to be greater. The default spacing algorithm works very well. Speaking of honesty, the greatest retention really does come from judging yourself as honestly as possible when reviewing a card. Even if it’s something that you know you used to know inside and out, if you can’t fully (and relatively quickly) answer a card, you should click “again” so that the card is reset and you view it more frequently. However, if you click “again” on a card eight times, it will be considered a “leech” and it becomes suspended from the deck. This action is the software trying to protect you from wasting your time learning that particular poor card. If any of your cards reach the leech status, you need to re-evaluate it. You most likely need to figure out a way to break it up into smaller pieces of information, or somehow increase your understanding of the topic. The solution may be to create some kind of visualization to represent the topic, as I demonstrated in the previous post. Somewhat related is the ability to “bury” a card during review. As you create cards, they will naturally have different levels of difficulty. Burying a card during a review session allows you to move on to the next card in the queue. This can be useful if you’d like to get through the perceived easy cards first, and then do the more difficult cards later by unburying them. If you don’t unbury a card, it will be automatically scheduled for review the next day. As I write this, I have about 2500 cards in my CCIE R&S deck, and I have reviewed 3624 cards during the past 30 days with an average of 121 reviews per day (which, not shown, takes about 30-45 minutes). The blue indicates brand new cards learned during a particular day. “Young” cards are those which are scheduled to be reviewed within the next 21 days, and “mature” cards are those to be reviewed more than 21 days from now. The color red indicates cards that I had forgotten and clicked the “again” button. I joke that the red indicates my level of self-honesty. The color yellow in the image deserves special mention. If you’re creating lots of cards in a short period of time, your next-day reviews can be substantial at first. Sometimes it helps to cut down the next-day reviews a bit by studying ahead the previous day. For example, I prefer to study as many cards as possible first thing in the morning, and I usually finish all the reviews in a single session. But if I know I’m going to have a larger than normal amount of cards to review the next day, sometimes I’ll study ahead later in the day. To do this, click the deck title > custom study > review ahead > 1 days. This creates a custom deck containing the cards that you would normally have reviewed the next day. I like to keep the reviews at about 75 or less per day, but sometimes it gets up to over 100. By doing this, all of tomorrow’s reviews are placed into a temporary custom deck, and I can review however many cards I wish, then delete the custom deck. The reviewed cards are treated as if it was tomorrow, and the remaining cards that were deleted from the custom deck will be scheduled as normal. For example, if you have 100 cards due for review tomorrow, but create the custom deck and review 20 cards, you will only have 80 card due tomorrow. By reviewing the cards scheduled each day and building up the retention of knowledge, I’ve found that when I move on to another learning source for the same topic, it is easier to pick out the details that I don’t already know and make new cards out of that to add to the deck. This demonstrates knowledge building upon itself. For example, as I mentioned, my CCIE R&S deck contains about 2500 cards as I write this. I created the bulk of these cards by going through the OCG books with a fine-toothed comb. Now that I have moved on to other sources of learning, I am usually aware of when I have already created a card for a particular topic by virtue of having seen it several times already. If there is something that I’ve already created a card for, but don’t remember, chances are that the new card will be somehow phrased differently anyway, and having both cards in the deck will also lead to greater understanding and retention. This end result of moving between different sources of information and realizing the details of what I have already learned is what has made using Anki so revolutionary for me, and why I felt it was important to devote yet another post to the wonders of spaced repetitions. I remember going through books in the past, and then moving onto other books within the same topic scope and feeling like I was essentially starting all over again. Back then, knowing how much information I needed to retain, it gave me a slight feeling of hopelessness. Now, being able to demonstrate to myself the progress I am achieving is extremely empowering. I’ve encountered several things in my day job which, previously, I would probably have had a vague understanding of, but now I can immediately recall the acquired knowledge and place it into action. That is a very powerful feeling. Having used Anki to learn Japanese Kanji and remember the hard-facts for my CCNP studies, I can attest that Anki is an incredibly powerful tool for committing fact and theory to memory, and is a great boon to those with the discipline to keep constant with their flashcards. When you want to gain an intimate understanding of whatever you are studying with Anki, its best to completely ignore the “easy” button imho. Another tip to help avoid fatigue when going through cards is to limit your decisions on grading how well you did on a card. Limiting your option to ‘good’ if you had no trouble, and ‘bad’ when you had difficulty recalling the information, will ensure you have complete mastery of the card. It does take more time to consume your cards, but it is a discipline well rewarded. Another fact of Anki is that it can be incredibly time-consuming. Even more so if you are writing down your answers for every card during your sessions. Give yourself a dedicated time slot everyday that you go through your cards. As you first start building your decks you may feel fatigued quite quickly after having done 30 or 50 cards and that is fine. If you commit to it every day, your endurance will quickly build up to the point that you will no longer fear the days where you encounter reviews spike over 150 in a day.